COPPER: TO CHELATE OR NOT TO CHELATE? Not the stuff of great literature, but if you've lost a one hundred and fifty dollar Emperor Angle to Cryptocaryon irritans you will know it is the stuff for which an answer would be nice to have. The common name, "Ich", seems appropriate on several levels, none of which are essential to this discussion, except to save writing Cryptocaryon (not to mention reading) every time a reference to it is necessary. Periodically the home marine hobby industry releases what it touts as the next (or first) best treatment for "Ich", only to receive mixed reviews from all those bereaved fish owners who've spent more money on another fish. Those disappointed with the newest wonder treatment are left to return to the old standby: copper. Yet even copper carries with it an age-old (well at least as old as chelation technology) "to-or-not-to" question. Understanding the significance of the question and why you should even ask, requires an understanding of the life cycle of "ich". It's life cycle contains three, very distinct, developmental stages. Tiny infant "swarmers" ("tomites", is the technical term) swim around the aquarium, looking for a host — that new angel fish trying to fill the emptiness left in your tank from the passing of "The Emperor". It is this stage at which the wee things are most vulnerable, and easiest to kill. Unfortunately, no tank is blessed with the presence of just tomites. The heartiest (and that is always plenty) of these fellows burrow into the skin of a host fish, feeding and growing to the point where they become visible to you as tiny white spots on the surface of your new pet. Developing into stage two, these "feeders" ("trophonts") mature to fall off the fish, settling to your tank bottom. Their new home becomes anything they can find on which to attach for the purposes of beginning cell division. After numerous cell divisions, the "breeder" ("tomont") cyst ruptures, releasing hundreds of new tomites and the cycle begins anew. At any moment in time, an infected aquarium contains huge numbers of parasites in all three stages of development - this is the principle reason why most "ich" treatments fail. The tomites are relatively easy to kill with medications, but the feeders are buried in the fish's flesh and actually protected to some extent by the fish's own mucous secretions, while the breeder cysts are protected by the hard shell-like covering of a body. Short-term treatments have the obvious short-term effect: the elimination of existing tomites. However, when the trophonts and tomonts mature, the "re-infestation" becomes apparent. Consequently, once the tank is infected, eradication is no simple matter, and short-term solutions are not effective. This precipitates a major problem for the hobbyist: namely maintaining an effective dosage 24 hours per day, for up to the 14 or more days. All this must be accomplished without risking overdosing the fish themselves. This is complicated further by the fact that drugs are naturally absorbed, broken down, or otherwise neutralized at different rates depending on the environment being treated. So while meticulously following the label directions of your treatment of choice might result in a cure for one aquarium, it could easily result in an ineffective under-dose in another and a fatal overdose in yet another. That's where copper treatments come in. 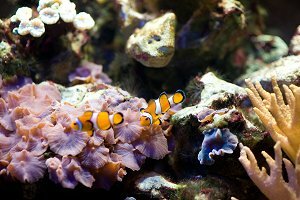 Notwithstanding its several drawbacks, copper salts have long been the treatment of choice of professional aquarists, primarily because the level of residual copper in the aquarium can be tested. This monitoring allows for intelligent adjustment of the daily dosage. The treatment level can then be kept quite constant in a range that is fatal to the parasite but not to the fish. Despite its flaws, copper is a very competent cure for these pesky little pests. Treating with copper isn't difficult, but it must be done correctly to be effective and safe. The prime directive is DO NOT WAIT to initiate treatment of an infected tank. At the first sign of infestation, the tank MUST be treated. It is not uncommon for the naive hobbyist to discover an infested fish, only to see the trophonts "disappear", and mistakenly believe a miracle has occurred. Unfortunately, "out of sight" is not out of tank. As soon as the cell division is complete and the trophonts cysts explode, your fish are infested again, only this time at ten fold the original infestation. Even the most effective treatment may fail at this point. There are several forms and many brands of copper compounds available to the hobbyist. The simplest form is commonly called "ionic" copper — copper sulfate crystals dissolved in water. Unfortunately, copper sulfate has a propensity to precipitate out of solution rapidly or to "bind" to other ions in the water. This problem can be exacerbated in an aquarium utilizing coral or other calcareous rock or gravel. Therefore copper levels must be monitored very frequently (at least daily, twice daily is even better) and new copper added as needed. The target value for ionic copper is typically about .15 parts per million (PPM). As with most things, there is a compromise on the market. In an effort to get the best of both worlds, treatments are available wherein the copper is contained in an organic complex. This "twist" retains the positive charge of ionic copper thus creating a treatment a bit more stable than ionic copper while supposedly increasing its effectiveness. Further claims suggest that such process reduces the amount of copper taken in by fish, resulting in a safer product. One must still do daily testing and adjusting of concentration levels. The target dose is generally about .25 - .35 PPM. Now for the bad news. Copper in any form is INAPPROPRIATE in a tank which is home to ANYTHING other than fish. Cryptocaryon is nothing more or less than an invertebrate. An invertebrate like your anemones, crabs, shrimps, live corals and "live rock". It follows then that what is an effective killer of ich will also be an effective killer of that $75.00 elegance coral you've spent $200.00 on light fixtures and bulbs to keep alive. Therefore, if your tank is infected and has inhabitants other than fish you MUST remove the fish to a quarantine tank where treatment can be effected. (Removing the invertebrates and treating the fish "in-tank" is generally a more risky proposition because removing all traces of copper after treatment is almost impossible.) The treatment tank can be the main tank, only if you are willing to allow it to become a "fish only" tank from that point forward. This is important because even a fish that appears to be uninfected might well harbor the parasites, allowing them to continue their life cycle. The cured fish will almost certainly become re-infected once they are put back into the original tank if the parasites are still present in quantity. The only way to be certain that an untreated tank is parasite-free is if it has also been fish-free long enough for all the parasites to have become tomites and starved before finding a host. In theory, this should be about fourteen (14) days, but any number of mournful hobbyist can attest that 14 days are not always sufficient. Twenty-eight (28) days are a more realistic time frame. By now it should be painfully obvious that a successful treatment of ich requires time, patience, an effective medication, some money and one thing more. Choosing a good copper test kit can be almost as involved and perhaps even more confusing than the copper selection process. For starters, a kit that is meant for ionized copper may not work on chelated copper - even if it has the proper range. However confusing, testing is essential and so is acquisition of a competent testing kit. Regardless of which form of copper is used, the treatment process should begin slowly. (One possible side effect of any copper treatment is an interruption of the biological filtration mechanism causing a rise in toxic ammonia and/or nitrite.) Your first test for copper concentration should be performed about 10 minutes after first adding copper to the aquarium. Conscientious treatment requires a determination of how much a given dosage raises the copper level in the tank. The optimum time to check this is when the initial tank level is zero. Schedule your testing for twenty-four (24) hour intervals. (If the copper level falls below its effective dosage - even for a few hours - some tomites will survive, attach to fish, and the life cycle will continue. Such reappearance means you get to add two weeks from that point, to the treatment regime, notwithstanding the current duration of treatment.) Immediately after the test is taken, additional copper should be added to return to the target dosage. If all goes well, fish start showing signs of improvement, including loss of visible spots, within a few days. It is important not to mistake this for a "cure". Cryptocaryon is certainly present in one or both of the not-so-visible stages of its life cycle. The minimum term of treatment should be 14 days, during which Cryptocaryon should have completed its life cycle and been eradicated. There are, and may be present in your tank, more than one strain of Cryptocaryon. A more effective term of treatment is 28 days. Always be mindful that should your fish show any sign of re-infestation, the concentration of copper should be immediately increased. The good news is that copper is an effective treatment for ich (and other parasites). Choosing the kind to use boils down to personal preference. Be aware of the limitations and these infestations are certainly manageable. A flu/inoculation analogy seems appropriate. It certainly aint a vacation in Spain—but neither is it incarceration in Alcatraz. A good dose of medicine and you (and your fish) will be back in the swim of things.